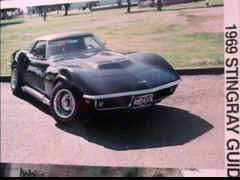 The Black L-89 11,000 mile dual disc clutch: Engine Code "LU" the only Roadster known in the world with Engine Code "LU" and the Rarest 1969 L-89 in existence with all the options and paperwork (10 documents from GM) featured in the book with loads of GM factory paperwork, protecto plate booklets, tank stickers,order sheets etc. the longest Corvette shutdown strike in history." The Index is very important and this book contains a complete and usable index. Most enthusiasts consider the 1969 Corvette to be the vette on which the legacy of the second generation Stingray was built, and they're right. For anyone considering working on, buying, driving or restoring a 1968, 1969 or an early 1970s Stingray there is a distinct scarcity of information. 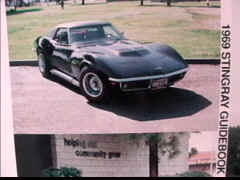 For the 1969 Stingray and similar years the Guidebook is an excellent starting point. It provides specifications for almost everything on the car, including power team combinations, part numbers, paint codes, various options and production sequence numbers. A flood of photographs and illustrations lights up this book and makes both browsing photographs and in-depth reading a pleasure for both the beginner and advanced expert. The supporting text is well written, easy to understand and full of references. This volume is packed with information on so many Stingray topics that it will delight, entice and guide any enthusiast through the 220 pages. The tables and charts are well organized and contain information that is so simple to understand that you'll find yourself going straight from the index to the easy to understand charts without a blink. All the information you need is just an index away. I can't even imagine what a book like this would be without an index. In fact I can't imagine what owning a Stingray would be like without this book. As a 1969 stingray owner I use it for information myself and I find it to be an exceptional, if not stunning resource of information. I would call it the Encyclopedia Britannica of the Corvette world. This book provides full value and use to anyone with an interest in the Stingray. Just like I do, readers will use it as a resource over and over again---for years to come. You can find almost everything in this new Guidebook and for the Stingray owner or enthusiast it's the Guidebook with everything you want and need to know. In putting this book together I paid particular attention to all the detailed information that in the past had not seen the light of day and which is so important to understanding how to put the Stingray together. The text, therefore, has had substantial thought put into the overall organization and towards how each individual topic is organized and presented. As I mentioned above this makes it possible to quickly locate information: you can go right to the photo, chart or text containing what you need to know. Even though I wrote the book, I'm continually amazed at the detail presented, the ease of understanding and the simplicity of presentation. All of these things make this work ideally suited for any Stingray owner. 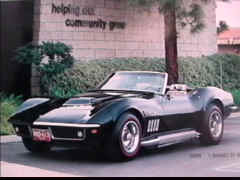 Reviews on this book have appeared in Corvette Fever (July 1995), Vette Vues (June 1995), All Chevy (June 1995), Chevy High Performance (July 1995) and Corvette Trader & Chevys (May 1995).